At what point can we have an honest conversation? All over the internet the BLM “investigation” into the sales to kill buyer Tom Davis, more than 1700 wild horses, are going viral once again. Allegations made in September 2012 went viral when they were made. These actions were shown to not be simply “alleged,” but fact. Those reports are now in the public sphere. Even though the allegations have been proven to be the truth, there are no consequences forthcoming, none. In 2012 at the Stone Cabin roundup 726 wild horses were captured, 210 were returned to the range after treating with PZP, 14 died, 493 were shipped to facilities and yearlings were adopted at a trap site adoption event. During this roundup WHE was under vicious attack. Websites and social media pages had been devoted to “destroy” our work. A mouth piece (that now works for extremist activists claiming they fight for the welfare of wild horses) said the pilot that hit this horse was skilled, not inhumane and launched a vicious attack against WHE. This individual even was instrumental in sending someone to the range to harass and threaten Leigh. We had won multiple court orders against inappropriate conduct and it apparently made a number of people angry. We were posting about the reality of the range and that BLM had no data to create decisions and that was also upsetting to certain interests. A BLM internal investigation, after a court ruling called the conduct inappropriate and gained a court order, claimed “nothing done wrong” at Triple B. The conduct that WHE documented and took to court was denied as having occurred, spun and justified. We were accused of making things up, being “uncooperative” or “know it alls.” After litigation was successful at Triple B and we won, the BLM finally admitted the conduct occurred. Yet they never admitted they did anything “wrong.” They created a humane handling policy (after more court orders). Instead of simply admitting the flaws and fixing them, it has taken years and years of relentless exposure to create change. It would have saved a lot of time if BLM just fixed the problem instead of forcing it to go to the courtroom. It would have saved a lot of drama if BLM had just fixed the problem instead of forcing it into a courtroom. On another level of this crazy game advocates were accused of “meaning well, but not understanding” the program or the range as we provided contrary documentation to BLM decision processes. In 2013 the National Academy of Sciences (NAS) confirmed every flaw that was put forth by advocacy. To date we still see the agency drag their feet to change these practices and actually create justified process that protects viable herds and the resources they need to survive. Not one of the recommendations for data is being taken seriously as BLM twists the report and fails to address the frame of management, the range. Instead we see insanity as a protocol to spay mares in the field is placed above all else. We guess they do not know how to do anything except force things into court. At Stone Cabin we met Dave Philipps. It was the beginning of a story that took over a year to complete. Phillips was interested in the work we were doing that dealt with wild horses going to slaughter, the beginning of the “Tom Davis” tale in print. 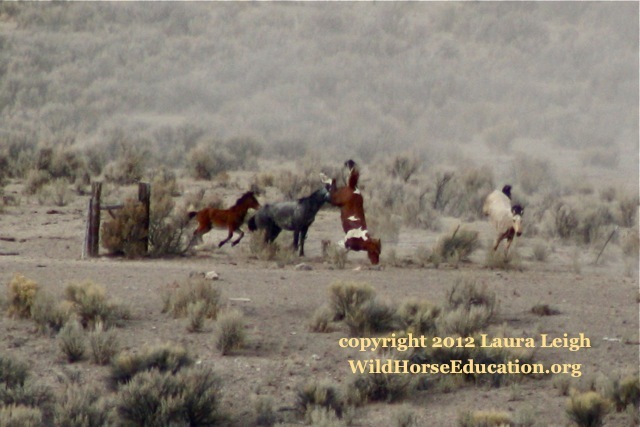 The story of more than 1700 wild horses going to one kill buyer alone, hit the news in September of 2012. Phillips broke the story through ProPublica and it caused a stir as it pointed out the contradiction between words and actions. This contradiction is often present in “policy vs. practice” within BLM’s wild horse program. The public response is nothing short of the social media phrase of “head, desk.” Meaning this type of response makes you want to bang your head against your desk. Sally was the person responsible for the sales. Many view her responses in the vein of “how stupid can she be?” The numbers represented by sales to Davis outpaced the entire BLM adoption program but yet there was no reason for her to be suspicious. Sally received a bonus for the numbers she achieved through the sales program. Acting illogically appears to be rewarded. At this juncture there will be no repercussion to Sally. There will be no repercussions whatsoever to anyone involved. 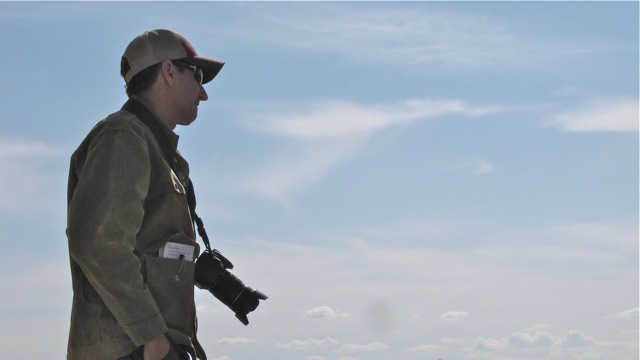 In addition the investigation never addressed connections between the kill buyer and the former Secretary of the Interior Ken Salazar (who actually threatened Phillips with a punch in the face). The investigation never addresses the well known connection between Tom Davis and Chavez. What we find incredulous is that the agency wonders why the public has no trust in any statement or action they take. “We treat horses humanely,” as they allow horses to be run through barbed wire, foals electric shocked in the face and the skids of the helicopter used to push exhausted and scared horses. “We do not sell wild horses to slaughter,” as they sell truckload after truckload to a kill buyer that ships through Chavez, in an action well known to anyone that can use a search engine. The public has absolutely no trust in any claim that the agency takes any action to actually “protect” wild horses. Snowstorm, roundup cancelled after documents were filed with court stating BLM did not have the data to back up a removal, yet no admission of fault. In another sociopathic move we see federal agencies, and even Congress, somehow blame the public that lacks trust in the agency is responsible for the environment of mistrust. Exposing these actions can stall movement aimed at actual appropriate and transparent action. The cycle is a bit insane. There is supposedly another investigation underway. This time into actions at Fish Creek. The agency appears to simply want the incident to “disappear.” Political powers exert pressure in many areas of public land management. Those political games often override any semblance of accountability to the public, the horses and the land itself. Are we on the verge of yet one more breach of public trust? At Fish Creek the permittee (that had violated law the year before running livestock in trespass for 8 months) was video tapped and urged on by pro horse slaughter factions to apparently violate multiple aspects of the code of federal regulations. Among the actions were an illegal water haul that drew horses off an HMA (not on the permittees land or into his allotment) and illegally removing a wild horse. All of these actions were done while taunting the federal government and attacking advocates on social media in an attempt to provoke. Will the government actually do a timely investigation and act appropriately? Politics seem to continually over ride any policy, protocol or law that presumable creates a framework that the public is expected to adhere to and expects the government to hold themselves and others to. Many are already expressing frustrations that show little faith that any accountable actions will come from any investigation on issues that involve wild horses. This is leading to a provocative climate that the agency is failing to take responsibility for. The “Tom Davis” situation is a clear example of agency action that creates the climate of distrust. Multiple other layers of the same “brush it aside” attitude when it comes to flagrant violations of law yet blame advocacy for the climate of distrust. It really is like living a mental illness. Many people are asking “What can we do?” about Tom Davis and the lack of accountability. You can write letters to BLM and DOI. You will likely simply receive a form letter that says BLM has changed policy. Your frustration will likely be brushed aside. But don’t take it personally, even a letter from a Congressman was never answered. We understand the constant frustration. We know you want to be heard. If you write to your Senators or Congressmen send us a copy of your letters to WHEqna@gmail.com We will include them in our print section or in our next video. We will continue to try to implement the changes you seek. Will the agency ever have the capacity to have an honest conversation about handling, range management or the sale program without having to do a 3 year “investigation” or having litigation filed? We are the only voices our wild horses have. We will continue to try to create an honest conversation, no matter the odds. We must sit at this table, armed with the truth, and move forward.